Just look at that face. 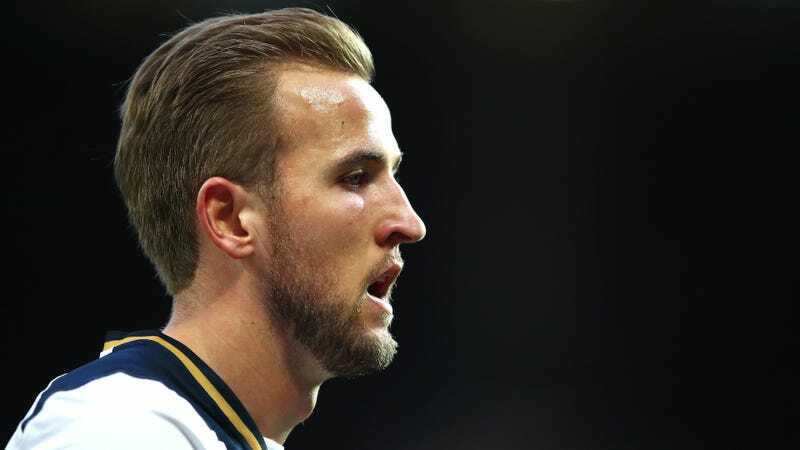 If you showed a bunch of people who didn’t know any better a picture of Tottenham’s unassuming star forward Harry Kane and asked them to guess what he does for a living, I’m quite confident that “pro athlete” would rank way down the list, somewhere behind “accountant,” “handsome shoe salesman,” and “model/actor for magazines or movies needing someone who looks astoundingly English.” He’s got the hairstyle (and hairline) of a dad. He always has his mouth open like a goober. He’s big, but doesn’t have an ideal build specifically and unmistakably honed to run and leap all day long. Kane physically does not look like an athlete, and he doesn’t really play like an elite one, and yet there he is, constantly and consistently performing like one of the best strikers in the game. Take, for comparison’s sake, Mario Balotelli. Even if you don’t watch much soccer, you look at Balotelli and assume he’s great at it. He’s usually sporting some wild haircut, a manifestation of his outsized confidence and desire to be seen, and he has a body his compatriot Michelangelo would’ve wept to have been able to immortalize in marble. Not only that, just watch him for any given stretch on a pitch and you can see why practically every manager he’s had has claimed that Mario could be the best in the world. Everything comes easy for Balotelli. He’s stronger and faster than anyone on the pitch, he can burn past or crash into and off of defenders en route to goal, he wheels around all spins and twirls to evade opponents like a ballerina when necessary, he’ll complete backheel passes to teammates you would not have thought were possible, and he can piledrive or finesse shots into the corners of the goal from any angle and any distance. Even his famously lackadaisical way of lounging around the pitch appears to communicate his superiority; he doesn’t try like everyone else because he doesn’t have to, he’s just that good. Sure, Balotelli isn’t actually as good as his nigh unlimited range of skills would have you believe he is, but a crucial part of why no one finds it strange that Balo has been given something like 30 second chances in his career is that he has obvious, tantalizing talents that knock you off your feet whenever he chooses to express them. Harry Kane is almost the exact opposite. Not only does his body not immediately scream “I’M A WORLD-CLASS ATHLETE, LOOK AT ME” (along with that face, I think it’s his shoulders that are at fault here; they’re really high and tight, and give him a rectangular appearance that makes it seem like it’s a struggle for him to wrestle his way into and out of jackets), his game doesn’t either. He doesn’t move around the pitch with any particular grace or speed. His feet either aren’t quick enough or haven’t been trained to master the fancy dribbles that inspire fans to make and seek out compilations of him humiliating defenders with the ball at his feet. (For example, this Balotelli “crazy skills” comp has over 15 million views. The highest view count for a Kane compilation with the word “skills” in the title is this one with a little over 150k. Right on that one’s heels views-wise is this one with a bepadded Kane tossing around and kicking the pigskin with the Kansas City Chiefs.) As late as early this year, it was still not uncommon to see people wondering if Kane really was the real deal even after everything he’s already accomplished. The conspicuous evidence of Kane’s greatness isn’t exactly noticeable in a passive viewing of his matches or highlights. Instead, it’s there in the stats all that unexceptional-seeming play racks up. He had back-to-back 20-plus goal seasons in his first years as a regular and there’s almost certainly another on the way (he currently has 10 in 14 EPL matches). He has the seventh-most Premier League goals in a player’s first 100 matches (with the vast majority of the forwards ahead of him on that list only entering the league as fully formed pros in their primes). And that’s all by the tender age of 23. Kane isn’t immediately recognizable as a bonafide star due to a matter of perception. Though he’s not flashy about it, he really does have a vast array of skills; they’re just a little more subtle than people who set highlight reels to screaming techno are usually looking for. He’s good in the air and good at navigating his way down the pitch with the ball at his feet; he can score any kind of goal, be it inside or outside the box or on the volley or while running with the ball or taking a shot with a single touch; his preternatural calm in scoring positions always allows him to make the right choice about whether and when and where to shoot; he can drop deep to help build attacks with his feet or he can target the channels between and behind defenders to sprint onto a through ball; and his finishing is very good. The key to Kane’s game, though, is his ability to always know where to be. Soccer is at bottom a game of positioning, a sport where the most important thing is being in the right place to, say, offer a passing option to a teammate, or eliminate one for an opponent, or to be close enough to a striker to block his ensuing shot but not too close to one man so as to free up his teammates, or to have that uncanny knack for being in the right spot to poke home an uncontested rebound. It’s no use being the most technically gifted player in the world, one who can mesmerize a defender with all sundry of feints and stepovers and flicks, if the player can’t create space for himself or others in the most dangerous areas of the pitch. Balotelli might be the more viscerally attractive player, but because Kane can plod his way into the perfect spots on the field more consistently, the English striker is in reality a far better player than the Italian. Kane’s game isn’t an aesthetically pleasing one, and none of his skills by themselves are enough to wow you. But when it’s all mixed together in a single player, you get one who makes up for his lack of flair with simple, deadly efficiency.